October | 2013 | Planet Pedro! Or “Scotland is social democratic, but England is a Tory country,” which was first current in the days of the Thatcher supremacy, but has re-emerged as an axiomatic part of the rhetoric of the pro-independence camp. Alex Massie has addressed some of the issues in his Speccy blog piece http://blogs.spectator.co.uk/alex-massie/2013/08/two-nations-two-cultures-britain-is-divided-by-the-trent-not-the-tweed/ . This looks at the evidence of social attitudes surveys, and comes to two conclusions. The first is that if there are any differences between attitudes to welfare, public services and taxation between England and Scotland, it is not by much. And his second conclusion is – as the title says – that if the UK is divided, the fault line is not along Hadrian’s Wall but somewhere in the English Midlands. Any demarcation line is between the North and South of the UK rather than between English and Scots. This of course makes great sense if seen through the prism of the industrial economies of the respective regions, above all in the history of the north, of the industrial revolution, coal and steel based engineering, manufacturing, organised labour, slum clearances and Council estates. A good example is that of similarities between Glasgow and Newcastle-upon-Tyne. Both owed their prosperity to coal, iron, steel, the industrial revolution and shipbuilding. Both also sit at the centre of industrial regions, and both suffered massively in the 1980s. Both cities also undertook massive urban redevelopment programmes in the 1960s and 70s, and both have come back since the 1980s with regeneration programmes based on Garden Festivals and groundbreaking arts and culture programmes. Likewise similarities could be drawn between other populations: hill farmers in Argyll and in North Yorkshire; fisherman in Arbroath and Padstow; or people living in isolated communities in Norfolk and Caithness. What they have in common is far greater than what superficially divides them: e.g., whether they are Scottish or English. The other ‘evidence’ put forward by the Yes Scotland (or at least its leftish, sort-of, anything but Labour section) is that Scotland has consistently voted in a way which is more supportive of a left of centre agenda. However, current voting patterns do not support such a view. Most obviously, the Scottish Socialist Party has lost all of its seats in the Scottish parliament, and indeed the way in which its bubble has burst suggests that its popularity was always more due to the vast free publicity garnered by Tommy Sheridan than to inherent revolutionary tendencies in the Scottish population. However, the SSP was never likely to be more than a freak show on the fringes of Scottish politics. The real story is that of the SNP and its “leftness,” and there are two narratives which hole that description beneath the waterline. First, the spread of the SNP vote suggests that its message is not one of undiluted appropriation and redistribution. Even setting aside the phenomenal and probably anomalous results of 2011 election, the Nationalists’ seats of Perth and Kinross (formerly held by Sir Alex Douglas-Home and Nicky Fairbairn) and Perthshire North (ex-Bill ‘Biggles’ Walker) and their north-eastern strongholds of Moray and Angus are essentially Tory seats. It is therefore unthinkable that these constituencies are voting in support of a left-wing agenda. Secondly, the policies put forward by the SNP at elections and implemented in government are far from left-wing, and indeed more conservative than those of, for example, the Scottish Labour Party. The last time that the SNP stood on a platform to the left of the Labour Party was in 2003, when under John Swinney’s typical honest and forthright leadership, the party offered higher taxation to pay for better services. The outcome was that the SNP recorded a poor result, and in the process learned a lesson that has nor been forgotten: that there is no appetite in Scotland for higher taxation. As a result, both of the SNP’s succeeding successful elections in 2007 and 2011 have been pitched somewhere around the same place on the left and right spectrum to Labour. In the last (2011) election both parties presented very similar manifestos, with the sole exception being the SNP commitment to a referendum on independence. However, since then there has been a marked divergence between the two parties. In opposition, Labour has embarked on a bold project led by Johann Lamont to stake out its position as the voice of socialism by adopting Bevan’s “language of priorities” and has appointed a commission to investigate the sustainability of Scotland’s services accordingly. In contrast, the SNP has taken this as a spur try to consolidate its middle class vote, and has moved to the right of centre accordingly. The result is that its flagship policies are those which favour that vote most obviously – and which are most regressive as a result. Leading these is the policy of so-called “Free Elderly care” which is claimed as their own by the SNP but was in fact introduced by the last Labour/LibDem administration at Holyrood. From the start this policy had two fatal flaws: its sustainability and its equitability. On the first question, it is difficult to see how the policy can be maintained indefinitely in the face of an ageing demographic. On the second, it is even more difficult to see what attracted Labour to a policy which has the effect of preserving unearned inherited wealth, but which does nothing for the least well-off. Put another way, it is impossible be see how left-wing it is to have a policy which has zero benefit for people in Whiteinch, but means that people in Jordanhill can pocket the cash from their mother’s house rather than putting it towards the quality of her care. “Free” care is deeply regressive, but the SNP know it to be popular with Scotland’s far-from-left-wing electorate. A similarly populist policy is that of “free” university tuition, which makes an absolute priority of university students, rather than addressing the more pressing issues of Scottish education. For example, the same money invested in early years provision in deprived areas would have much greater impact on educational outcomes and social equality than paying the fees of rich students. This policy has also cost an estimated 42,000 places at FE institutions in Scotland, which would have been likely to have been able to benefit working class students studying vocational and practical subjects. Again, this policy has undoubted populist appeal, and throws cold water on the claims of a Scottish left-wing ethos. 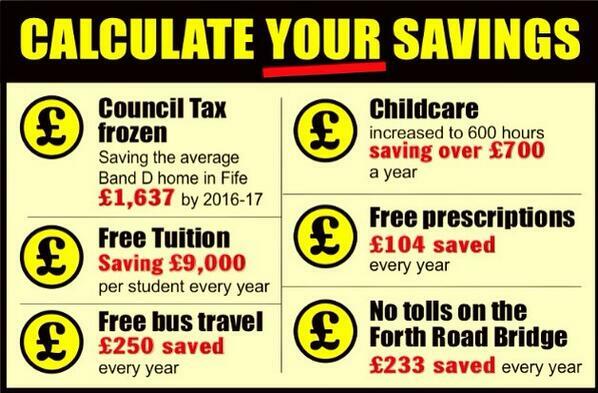 A further example is that of the indefinite Council Tax Freeze. The SNP came to power in 2007 with a mandate to create a Local Income Tax to make local taxation fairer. Not only has it failed to do so in the intervening 6 years, it has frozen the Council Tax, a policy which favours those in largest properties most. At the same time, the policy deprives Councils of means to raise revenues for local services: not only this regressive, it is also deeply anti-democratic. It is no way left-wing, and indeed has been taken up in England by the Tory/LibDem coalition Government. However, as the SNP might as well have adopted the trading name “webuyanyvote.com” and the people of Scotland look have been keen to sell, we can dismiss the myth of any bias towards socialism or social democracy in the so-called Scottish psyche. A left-wing Scotland would surely have rejected such crude overtures. Conversely, if Scotland really was a naturally left-wing or even social democratic country, it would have a left-wing or truly social democratic government already. As far as best losers go, as a rule of thumb 29 points is odds-on to get through to the semis; 28 is evens; and 27 is odds against. This means that one or two more correct answers would have been very useful. On the Pompey Round, my two wrong answers were the results of two separate failings. The other wrong answer was again something I knew, and this time what I knew was right; the problem is that it would not come out of my mouth. First it would not come out at all, then it would not come out correctly, so I ended up with an anagram of Lassana Diarra (‘Lassiana Darra’). As John Humphrys said “close” – but not close enough. There are two ironies here. The first is that when I discussed the subject with my cousin, Steve Cogan (another fan), he put the same question to me, and I came up with Diarra easily. The second is that I had rehearsed the pronunciation of Lindy Delaphena (Jamaican forward of the late 1940s) that morning, but I got tongue-tied with Lassana Diarra. On the General Knowledge round, I was really lucky with my questions and got into quickfire groove – in fact I outscored the heat winner for GK, despite 2 passes, and never having heard of the salamander in question. By the time the final question came round, I did not know the answer so I thought of a Victorian artist (Atkinson Grimshaw) and mumbled the first bit to avoid a pass. All in all, it was a very enjoyable experience: any quiz that includes both Prokofiev and Huckleberry Hound cannot be all bad. All of the production team were very friendly and supportive, although John Humphrys was a bit aloof, but that is part of what you expect. They were also kind enough to tell me that I had done exceptionally well for a first-time participant. I certainly enjoyed the chance to tell the world about Pompey’s exceptional history as one of the great clubs in English football. Two points to end on. The second point is about my cousin Steve. He was very ill with inoperable cancer when we spoke about Diarra and died in July. He would have given me no end of good-humoured stick for not getting that question right. I would have liked to have been able to dedicate a win to Steve, but it was not to be.